Built from local stone this ""chocolate box"" grade II listed (approx. 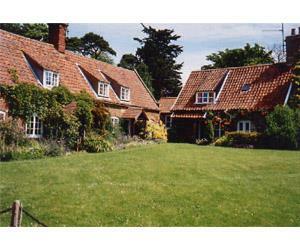 200 year old) cottage is set in a conservation area on the Church Green and is full of character inside and out. It is furnished to a very high standard - you will not want to leave! Beamed ceilings; large fire place with wood-burner; piano; three bedrooms; fully fitted kitchen/ diner, rear garden-patio and furniture. From King's Lynn station travel to Hunstanton, follow signs to A149. After 14 miles reach Heacham, continue on A149. At Norfolk Lavender turn left. Reach Wheatsheaf pub turn right.